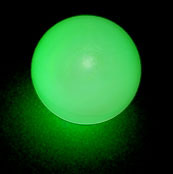 4 Glow-In-The-Dark pinballs. These are great in all of your games that have a backlight or black-out mode. They will absorb any light but they like backlight wavelength the best. These are the perfect replacement for your Viper Night Drivin' fluorescent balls (they didn't really glow to begin with, they were just reflective)! Remember, to really see the effect, your machine needs a blackout or black light mode, they are glow in the dark...not glow in the light. In addition, they make the play of other games faster!